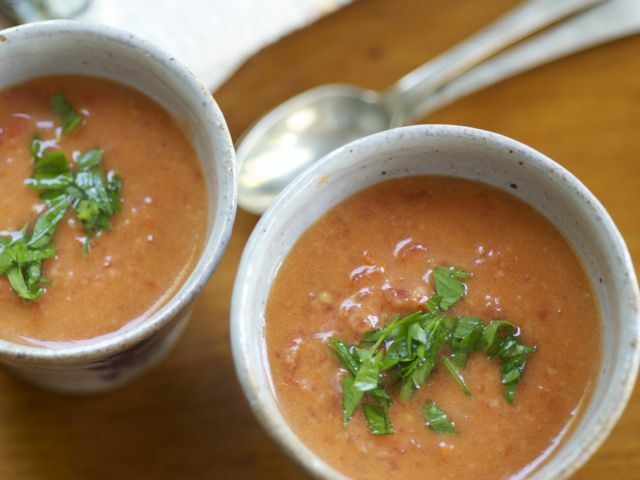 At the height of tomato season, when temperatures outside run high and hearty appetites disappear, this recipe is a welcome thing. My friend Kari learned it from a Spanish cook and modified it to suit her taste. We've modified it further but still like to think it has something authentic going for it. Place half of the tomatoes, garlic, pepper, bread, vinegar, salt, cumin, and sugar in a food processor. Blend until no large pieces remain. With the motor running, add the remaining tomatoes, and when well processed, gradually add the oil. Beat as smooth as possible. Optional: Pass the purée through a food mill or strainer, pressing the back of a metal soup ladle against the pulp to extract as much liquid as possible. Discard the solids. Chill for several hours or overnight. Taste for salt and vinegar and adjust those flavorings if necessary. If you desire a less-hearty soup, thin it with ice water. At the table, pass bowls of chopped parsley and sweet bell peppers as garnishes.